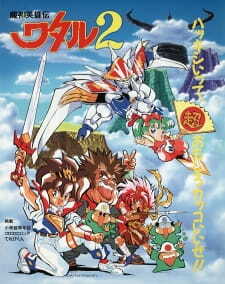 This is the sequel to Mashin Eiyuden Wataru first season. Wataru has been lived happily on earth after he defeated Doakudar. When he plays around with his friend, Ryujinmaru appears and ask him to fight again. It appears that the 7 Stars Mountain, the source of Mt. Soukai's rainbow, have been taken over by Doakadar (Doakudar's brother). If all the stars mountain loses their brightness, Mt. Soukai's rainbow will fade and everyone will live in the darkness for eternity. Once again, Wataru has to go through all the 7 stars system and destroy this new stronger enemy. Well its just too bad that i never had the honor to play the original game if i owned a famicon, or super famicon . The story itself how it progress is slightly diffrent from its prequel and by that i mean its still has that rpg adventure type when a boss from a realm ( level) has been defeated, wataru and friends do to rises to another level with a secret or extra stage inbetween, the diffrence is that each realm has a discription, the enemy fighters has stats on them like power, speed, stanima and/ or magic. Artwise its still the same art since its 2 years since the serie started, though it was 1990 so there may be some sight improvements by tape recording and colour editing and stuff compared to late 80's , but in the biggest part not much is diffrent, same can be sayed by the sound and the OP/ED parts, tough could be repetitive at some parts and episode's. it kept the potential going and even though today it only is famous by a select few outside of japan , overall its worth a watch if u are not minded to watch a kidsshow, but prepare if ever comes a sub-version on bluray or dvd to have some deep pockets, japan import ofc, still worth it!